The author offers her understanding of the term ‘reflexive item’ as a type of discursive unit. Such items conditionally pertain to the speech ones and appear only as a speaker’s reactions on his / her own speech act. While passing through problematic speech patterns, the speaker often hesitates, looks for a particular word or phrase and often uses the units from different discursive class, i.e. the verbal hesitatives (or “verbal hesitation” items) and their chains (hesitative constructions). When the word / phrase is finally found, the speaker reflects his own choice, as if relieving his / her own responsibility for the item found (and its accuracy), or expresses his / her attitude towards it. Sometimes, though, speakers use reflexive items regardless of the hesitation situation, just in order to evaluate his / her speech. These last items are in-depth analyzed in the article. The research is based on two sets of speech texts, ‘One Speech Day’ (Russian Speech Corpus) and the Oral Sub-corpus of the Russian National Corpus. Keywords: Russian spontaneous oral speech, functional speech items, discursive items, Russian speech corpus, reflexive. The article deals with the lexicographical aspect of the Russian lexeme drugoj (other) in comparison with the factual semes denoted by this word. Based on the methodology of linguistic semaciology, the analysis measures differentiations of the semes presented in some 19th – 21st centuries dictionaries and the communication in real-life and fiction. Such analysis allows to offer a generalized semanteme of other, which highlights strictly opposite as well as gradual semantic features, leads to multi-various interpretation of the word in communication, and requires more linguistic scrutiny in further lexicographical work. Keywords: “other”, semanteme, obligatory, differential, semes. This article is devoted to the “Basic Elements” code of culture in Russian and Chinese linguo-cultures and analyzes Russian and Chinese idioms with the element “water” from the point of view of their cultural sense. Keywords: linguo-cultural studies, code of culture, language, culture. The article presents the system of typological features of the rhetorical text, based on the communication foundations, and shows the correlations between verbal communicative act components and rhetorical text’s typological features. Keywords: rhetorical text, effective communication, typological features, model of verbal communication / verbal communicative act. The article examines short radio programs (1 to 3 minutes), based on the history of various topics, as a new genre in Russian talk and music broadcasting. The author studies the history of the “story” genre at Russian radio, and the concomitant problems. Keywords: story, radio genres, feature. This article considers peculiarities of Evgeny Klyuev’s prose style based on his book “Strannovedenie”. The uniqueness of his style is due to the fact that E. Klyuev is not only a writer and poet, but a professional linguist. He is interested puns and experiments with the words in their various manifestations. Each of his books is “working” with a certain occasional stylistic device. In “Strannovedenie” it is the original etymology, which determines the content and semantic integrity of his short stories, becomes a text-forming device and the main distinguishing feature of his style. Keywords: language game, author etymology, the nonce words. The article deals with verbal and non-verbal communication of women in accordance with their gender roles in society on the material of the novel by D. Rubina “On the Sunny Side of the Street”. Keywords: the novel by D. Rubina “On the Sunny Side of the Street”, speech, speech behavior, speech characteristics. The article considers literary critical papers of Alexey V. Chicherin (1900–1989), placed in the context both of his literary works and of the history of Russian literary criticism. The major attention is paid to the transformation of Chicherin’s talent for writing into his philological methodology. Keywords: literary critic, literary artist, literature, literary criticism, philosophy, rhetoric, hermeneutics, pasticcio. The article deals with the concept of “legend” in the conceptual system of academician A. A. Ukhtomsky and N. P. Antsiferov. For both outstanding researchers it is an important component of the doctrine of a “dominant” (A. A. Ukhtomsky), decisive for local and historical method of cultural judgment (N. P. Antsiferov). The Nation authorizes preservation of “a legend” in history, and it becomes a kind of “cultural memory”, able to transfer to the next generations, becomes one of the main ways of fight of culture for eternity. Keywords: legend, culture, local and historical method, dominant, eternity. The author considers the epigraph and the first poem of the “Lodestars” poetic collection by Vyacheslav Ivanov as two tone-giving devices, tuning the reader’s perception of the whole book. The epigraph, taken from Dante’s “Purgatory”, offers the idea of ascending, which anticipates the later Ivanov’s doctrine of ascent and descent. The poem affirms Ivanov’s allegiance to the idea of Vladimir Solovyov about the necessary and productive connection between chthonic and celestial. Keywords: Vyacheslav Ivanov, “Lodestars”, Dante. The author explores different means of characters’ nominations in A. Chekhov’s stories), and argues that the choice of repeated nomination is an important text-generating mechanism, helping to avoid monotony and ensure coreference. The author comes to the conclusion that by means of repeated nomination Chekhov’s narrator can polemicize with the subject of nomination’s point of view, provide a multifoci description of a character and mark a change of register. Keywords: narrative paradigm of persons’ nominations, first persons’ nomination, repeated persons’ nomination, coreference, register. The article studies Chekhov’s stories describing a particular human type. The influence of writer’s work in humorous magazines is very noticeable in late stories of this kind: Chekhov uses old literary devices and composition principles but they perform new aesthetic functions. Keywords: Russian literature, Chekhov, “petty press”, humorous magazines, poetics. The article shows how modern stories transform the plots taken from “the Caucasian text” of Russian literature. A special attention is paid to the relationships between these texts and the heritage of Russian Formalists. Keywords: «the Caucasian text», story, plot, distancing, function of a genre. 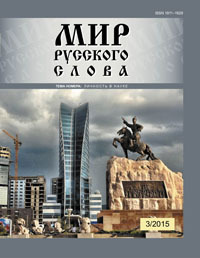 The paper is devoted to the Area Studies component in teaching Russian as a foreign language with the emphasis on the mental image formation of the country of the language to be studied, and provides an overview of the main points of view on the role of linguocultural studies in foreign language studying in the framework of the methodological concept. The author proposes using of regional geographic quiz as a lesson game form. Keywords: Area Studies, intercultural communication, Russian as a foreign language, culturological component, Russia, communicative competence, motivation, game. The article is devoted to the problem of modern students’ reading of books on Great Patriotic War. The author proves the necessity of reading books about the war as one of the factors in the formation of patriotism among modern youth. The article presents the results of the monitoring of 18–20 years students, exposing attitude of today’s youth to one of the most important pages of our history, the Great Patriotic War. Keywords: books on war, patriotism, problem reading, modern students, system of values. The author argues that the development of intercultural competence of Mongolian Russian Studies students requires the use of the texts able to motivate students to intercultural comparison, and the notes and diaries of Russian travelers about Mongolia can be considered as the sources for such texts. The use of such texts not only develops intercultural competence of students, but also increases the level of Russian language proficiency and contributes to a better knowledge of their own culture. Keywords: records and diaries of Russian travelers, intercultural competence, comparison of cultures, reading the text.